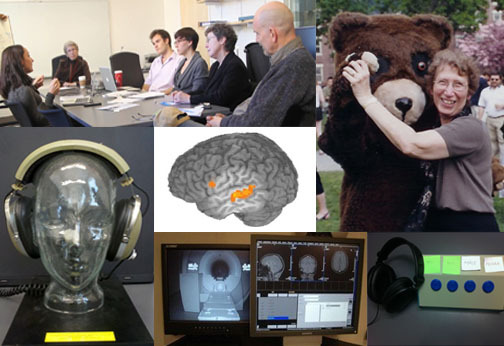 The Brown Speech Lab examines the cognitive and neural bases of language production and comprehension. Research approaches consist of behavioral studies on patients with aphasia as well as psycholinguistic and functional neuroimaging studies on individuals with normal language processing. The Brown Speech Lab is equipped for preparation of auditory stimuli and for testing of normal participants, elderly normal controls, and aphasic patients. Stimuli are synthesized, analyzed and presented using a dedicated speech software (BLISS). The lab includes a sound-attenuated room and a portable eyetracker (SMI iView X RED Remote Eye TrackingSystem) for behavioral experiments. A shared departmental IAC soundproof booth is also available. All functional neuroimaging experiments are conducted at the Brown University MRI Research Facility. The Brown Speech Lab: "Go Better, Do Better, Try More."